Part 1 dealt with fundamentals, imports and exports. Part 2 follows on from part 1 and explores additional features of the Managed Extensibility Framework (MEF). This time the focus is on metadata and creation policies. Exports can use metadata to expose additional information. To query this information, we use the class Lazy<>, use of which avoids causing the composable part to create an instance. For our example application, we will go back to the example from part 1. 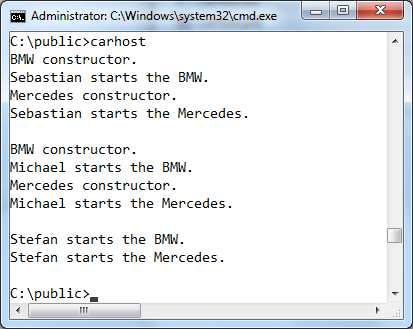 We have an application (CarHost.exe) which uses imports to bind different cars (BMW.dll and Mercedes.dll). 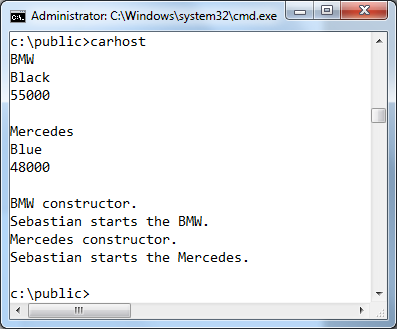 There is a contract (CarContract.dll) which contains the interface via which the host accesses the exports. The metadata consist of three values. Firstly, a string containing the name (Name). Secondly, an enumeration indicating a colour (Color). Lastly, an integer containing the price (Price). In this option, metadata are exposed using the ExportMetadata attribute. Each item of metadata is described using a name-value pair. The name is always a string type, whilst the value is an Object type. In some cases, it may be necessary to use the cast operator to explicitly convert a value to the required data type. In this case, the Price value needs to be converted to the uint data type. We create two exports, each of which exposes the same metadata, but with differing values. The ICarContract interface exposes the method, so that it is then available to the import. It represents the ‘contract’ between the imports and the exports. The enumeration CarColor is also defined in the same namespace. Metadata for the import can be accessed using the class Lazy<T, TMetadata>. This class exposes the Metadata property. Metadata is of type Dictionary<string, object>. If we want to access a specific item of metadata, we need to verify that the export has indeed defined the required item. It may well be that different imports expose different metadata. On running the program, we can clearly see that accessing the metadata does not initialise the export parts. Only once we access the StartEngine() method do we create an instance, thereby calling the constructor. Since the metadata is stored in a class of type Dictionary<string, object>, it can contain any number of items of metadata. This has advantages and disadvantages. The advantage is that all metadata are optional and the information they expose is entirely arbitrary – the value is of type Object. However, this also entails a loss of type safety. This is a major disadvantage. When accessing metadata, we always need to check that the metadata is actually present. Failure to do so can lead to some nasty runtime errors. The interface for the metadata is used during verification between import and export. All exports must expose the defined metadata. If metadata are not present, this again results in a runtime error. If a property is optional, you can use the DefaultValue attribute. To avoid having to define all metadata in an export, all properties in this example will be decorated with the DefaultValue attribute. The ICarContract interface and the exports are created in exactly the same way as in the first example. To access the metadata, the interface for the metadata is used as the value for TMetadata in the Lazy<T, TMetadata> class. In this example, this is the ICarMetadata interface. Individual items of metadata are therefore available via the Metadata property. Since the ICarMetadata interface specifies the name and type of the metadata, it can be accessed directly. This type-safety brings with it a small but useful advantage – it is now possible to access the CarParts property using LINQ. This means that it is possible to filter by metadata, so that only specific imports are used. The first foreach loop outputs the metadata from all exports. The second uses LINQ to create a query which produces a list containing only those exports where the metadata has a specific value – in this case where Color has the value CarColor.Black. 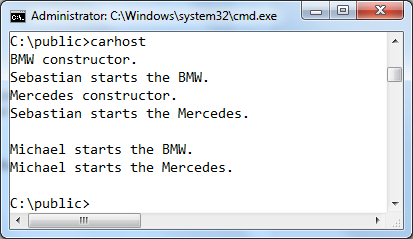 The StartEngine() method of these exports only is called. The final foreach loop calls this method for all exports. Once again, we can clearly see that neither outputting all metadata nor the LINQ query initialises an export. 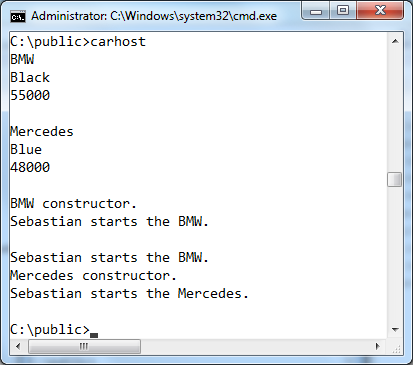 A new instance is only created (and the constructor therefore called) on calling the StartEngine() method. In my opinion, interfaces should be used to work with metadata wherever possible. Sure, it may be a little more work, but this approach does avoid unwanted runtime errors. Defining metadata in the export has one further disadvantage. The name has to be supplied in the form of a string. With long names in particular, it’s easy for typos to creep in. Any typos will not be recognised by the compiler, producing errors which only become apparent at runtime. Of course things would be a lot easier if Visual Studio listed all valid metadata whilst typing and if the compiler noticed any typos. This happy state can be achieved by creating a separate attribute class for the metadata. To achieve this, all we need to do to our previous example is add a class. We can not decorate an export with metadata by using this newly defined attribute. Now Visual Studio can give the developer a helping hand when entering metadata. All valid metadata are displayed during editing. In addition, the compiler is now in a position to verify that all of the entered metadata are valid. Now we add a property of type AudioSystem to the ICarMetadata interface. Whilst the Mercedes has just a radio, the BMW also has a CD player and MP3 player. To achieve this, we create an additional attribute class. 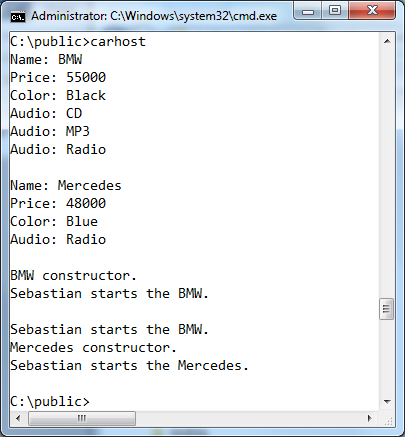 This attribute class represents the metadata for the audio equipment (CarMetadataAudio). To allow us to specify multiple options for this attribute, this class has to be decorated with the AttributeUsage attribute and AllowMultiple needs to be set to true for this attribute. Here, the attribute class has been provided with a constructor, which takes the value directly as an argument. There is one further option, but this I will leave for a later post in which I will talk about inherited exports. It allows both the export and metadata to be decorated with an attribute simultaneously. In the previous examples, we used the Export and ImportMany attributes to bind multiple exports to a single import. But what does MEF do when multiple imports are available to a single export? This requires us to adapt the above example somewhat. The exports and the contract remain unchanged. In the host, instead of one list, we create two. Both lists take the same exports. This change means that two lists (imports) are assigned to each export. 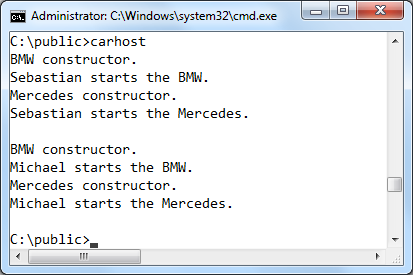 The program output, however, implies that each export is instantiated only once. If Managed Extensibility Framework finds a matching export for an import, it creates an instance of the export. This instance is shared with all other matching imports. MEF treats each export as a singleton. We can modify this default behaviour both for exports and for imports by using the creation policy. Each creation policy can have the value Shared, NonShared or Any. The default setting is Any. An export for which the policy is defined as Shared or NonShared is only deemed to match an import if the creation policy of the import matches that of the export or is Any. To be considered matching, imports and exports must have compatible creation policies. If both imports and exports are defined as Any (or are undefined), both parts will be specified as Shared. The creation policy for an export is defined using the PartCreationPolicy attribute. In the case of the Import or ImportAny attribute, the creation policy is defined by using the RequiredCreationPolicy property. The following output illustrates the case where the creation policy is set to NonShared. There are now two instances of each export. It is also possible to combine creation policies. For the import, I have decorated one list with NonShared and two further lists with Shared. The first list has its own independent instances of the exports. Lists two and three share the same instances. It is very encouraging that a framework of this kind has been standardised. Some Microsoft teams are already successfully using MEF, the best known example is Visual Studio. Let’s hope that more products will follow suit, and that this ensures that MEF continues to undergo further development. Part 3 deals with the life cycle of composable parts. Cloudera Navigator gives you a chance to mechanize the use of metadata Do My Assignment to explicit element classes utilizing the approaches you characterize. The arrangement determines the activities to be performed by Navigator Metadata Server and the conditions under which to apply them. Hi, I am going to start learning developing for my website 7 dollar essay website reviews. Can you explain to me the core difference between structured metadata and detailed metadata? And what are the main purpose behind the metadata? is movie4k safe to use? well this is a very important question which the people who are using movie4k should ask themself.